There are different options to create or manage partitions under Linux – Parted is one of them. This note describes its usage and the use case when creating a new partition table. Use parted interactively to enter commands one at a time. Include only the device as an argument to invoke interactive mode. 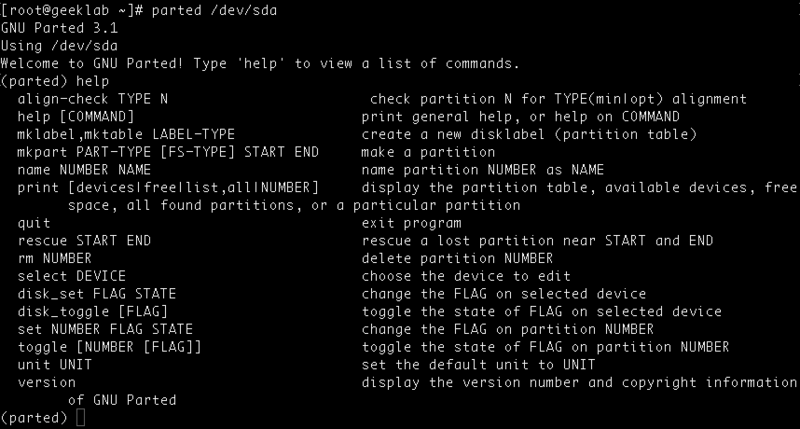 Select the disk on which the partition is being created, in the below example /dev/sdb is being partitioned. You can select the disk in below given two ways. The following example creates a new partition table by using the mklabel command. The disk label type must be one of the following: aix, amiga, bsd, dvh, gpt, mac, msdos, pc98, sun, or loop. In the above output, it is possible to see that different LABEL-TYPEs are supported in parted. It is important to note that one will require to use msdos as LABEL-TYPE for generic Linux. be lost. Do you want to continue? To check free space and any existing partitions on the disk use the print sub-command. As you can see 21.5GB space is free on the disk and no partition is created yet on the disk. NOTE: Parted asks for the FS-Type while creating primary partition unless a logical partition is to be created. One can also delete an existing partition using “rm” command, as shown in below example we have 2 partitions with number 1 and 2. Verify that you can see only the partition number 1 now.